Thirteen years ago, when I was 75, you recommended that I buy a Citroen Berlingo. It has given good service and has done 70,000 miles. A couple of months ago it would not start. I called in the road-rescue and the mechanic eventually dealt with the problem by removing the fuel-cap and releasing a vacuum that had formed in the fuel-tank. My local garage cleaned the area around the fuel-pipe, but the same thing has happened twice since then – simply solved by removing the fuel-cap. But my local garage seems unable to deal with why the vacuum is caused. Please could you suggest my next course of action? It will be caused by a blocked fuel tank breathing system. Air has to enter the fuel tank to replace the fuel pumped out of it. But to prevent fuel fumes leaking into the atmosphere there will be some kind of filter, possibly a carbon canister. That is where the problem is. Normally BMW TPMS works from the ABS sensors and reluctor rings rather than from the valves. If that is the case on your car you can switch to 16-inch wheels and 16-inch non-runflats (preferably Michelin Cross Climates), but you'll need to be in the AA to avail yourself of its temporary spare service because tyre puncture repair kits almost never work. Yes you need to disclose the modification to your insurer. I have a 2001 Citroen Xsara 2.0d with 155k miles. It matches my needs very well as it has enough space for my mobility scooter and is easy to load. But the glass in the driver side door mirror was smashed in a close encounter. Citroen no longer makes that model mirror. I ordered an equivalent from eBay, but, despite being a superior mirror, it is smaller than the original and the fitting is different and it will have to be attached using sticky back plastic. Why would Citroen discontinue a minor spare part? Was the Xsara not popular? And am I driving illegally without a functional mirror? Manufacturers are only required to supply parts for cars up to 10 years old. But you can normally get door mirror window glasses from car accessory shops that you fix in place using double-sided numberplate tabs. If you can't get the exact shape, you can get an approximate shape and that will be enough. I drive a BMW F10 535d and run my tyres at 2.2 bar front; 2.5 rear. After a motorway run they reach 2.4 and 2.7 bar. A recent service check indicated that the fronts were worn more on the outside and the rears worn more in the middle. Should I increase pressure in the front and decrease in the rear to even the wear? As you wrote, pressures rise with heat, so the 2 bar rises on a motorway run are normal. I'd drop the pressures a couple of bar at the back. Leave the fronts as they are. That alone might reduce the understeer that is causing the front outer shoulder wear. You should also make sure you're not applying too much steering lock, as that would also cause front outer shoulder wear. I don’t need to tell you to get all your braking done before the corner. You already know that. I drive a Mercedes Benz CLK 200K Elegance, registered June 2009. I have had it for over 6 years and it has 55,000 miles on the clock. I love it and have no wish to change it because the modern version is bigger. I know it is not worth very much even though it is in excellent condition. I was recently diagnosed with cancer and one of the side effects of the drugs is muscle weakness. Would it be possible to get the seats changed to operate and adjust electrically? Are there any specialist companies who would do this sort of work, or should I go to my Mercedes dealer? He is helpful but wickedly expensive. I have a 2004, 1600cc Renault Scenic. I have had it for 13 years and after spending a fortune on various electrical glitches in the early days it is going well. The electric windows have all had new motors over the years and I dare not open the sunroof any more in case it won't close. Following the death of my husband last year, I am downsizing my home and hope to have some spare cash when I have moved. I need to replace my lovely car with an automatic model, due to worsening arthritis in my left ankle. 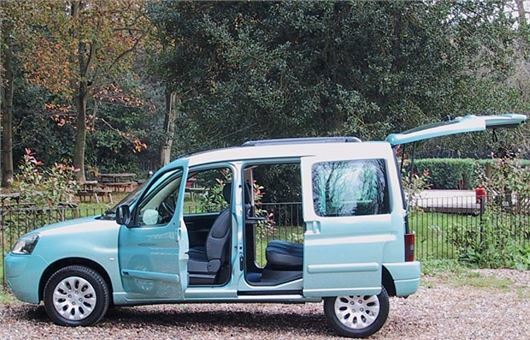 I love the seat comfort and all the secret storage places in this car, and the fact it can transform into a van, when house moves and tip runs call for it. Have all the notorious electrical issues been resolved in newer models or should I go for a totally different make? Does any other car have similar features? I would also like an onboard reversing camera or guide and a good satnav as my luxuries. A music system would be a bonus. My CD player packed up years ago and I was quoted over £700 to replace it, so I just make do with the radio. I am not intending to buy a new car, but a trusty used one, which my excellent, long suffering mechanic can maintain for me. I hope you can steer me in the right direction. The most reliable automatic MPV seems to be the Toyota Verso 1.8i Valvematic Multidrive S that has been around since 2009 so there's plenty of scope for buying 2nd hand. But, and it's a big but, your ankle probably means that you won't be able to left foot brake and you will not be in full control of any automatic, especially when manoeuvring it, if you don't left foot brake. 'Runaway automatic accidents' are not accidents at all. They are all caused by drivers failing to control the cars with their left feet. I own a 2008 Peugeot 207 Coupe Cabriolet 1.6 Sport that I've owned from new. The passenger window fails to go down and hence the roof mechanism will not operate. The Peugeot dealer did a diagnostic test at a cost of £71.40 and reported that it requires a new window regulator as well as a roof striker kit at a total cost of £772.06. I was not aware of there being anything wrong with the roof mechanism as when the button is pressed the boot lid lifts up but, as the window will not operate, the roof operation will not complete. It has only done 36,000 miles and I therefore wondered if you considered it worth spending that kind of money on the roof manoeuvre and whether it would be due for any other major works over the next couple of years such as timing belt, etc. What I'd do is use http://www.yell.com to search around for local <car sunroof specialists> to try to find someone who can fix it much more cheaply using existing parts. Dealers never do this. They always fix things the most expensive way by replacing entire components. If your car is a diesel then the engine has a timing belt and that, the tensioner, the waterpump and the alternator belt all need replacing. If it's petrol, that engine is chain cam and all it needs is fresh oil to run in to last the life of the car. I have always promised myself a Jaguar but cannot afford any of the current models. With a max budget of £5,000 what would be my best buy from the affordable older models that seem remarkably cheap? S-Type, X-Type or the even older XJ? I would do no more than 5,000 miles a year, so guess petrol would be the best option. What problems should I be aware of? The big Jaguars are cheap because of the potential for very expensive trouble. (That's why all ageing big luxurious cars a re cheap.) They can also have a rust problem. Straight sixes are more reliable than the early V8s. But if you get a good one you sink into sublime luxury. A 1994 XJ 3.2 sold for £1,120 inclusive at the Historics Classic Car Auction on 8th July. It was the cheapest car there. Lesser Jags are less. I used to like the S-Type 3.0 V6 manual. X-Type 2.5 and 3.0 V6s are four wheel drive. X-Type 2.1 V6s are front wheel drive, but this is a rare engine so hard to get parts for. And, being Mondeo based, FWD X-Types also came with chain cam 4-cylinder 2.0 and 2.2 diesels. Actually, all of these engines are chain cam. I wonder whether you may be able to offer any explanation and/or comfort about a recent scare which my 2008 Mondeo Ghia Estate diesel automatic suffered and for which the local Ford dealer near Norwich where we live and who have looked after the car for the last 4 years and 45,000 miles can offer no explanation. The car has done 106,000 miles. The aircon recently stopped working and a new condenser unit was diagnosed by the Ford dealer. The Ford part is quite expensive and a pattern part appreciably cheaper so I got the pattern part and the dealer fitted it. The following day I drove the car some 130 miles to a family gathering with aircon working fine and all well. At the end of the event I drove my daughter and her two young children to the local station a distance of less than a mile to catch their train home. Less than half way there, we all noticed a deeply unpleasant acrid burning smell, which initially I thought was coming from a passing vehicle, or perhaps a bonfire. It was not and as we arrived at the station minutes after setting off, clouds of evil smelling smoke were coming from under the bonnet. We all got out, I turned the engine off and I opened the bonnet releasing even more smoke. The smoke subsided, I could not see its origin and in due course it ceased, I started the car again without a problem and drove back to the do to collect my wife and drove home to Norfolk with some trepidation. There was no problem on the return journey or since and the dealers who have inspected the car and heard the story as above can find nothing to explain what happened. The smell was not one I have experienced before. I am familiar with the smell of burned out clutches, overheated brakes and hot and burning oil and most other motoring mishap smells. It was none of those. The smoke was pale rather than dark and very acrid. I wondered whether it was the DPF regenerating. This is not something I have encountered but only read about, so do not know what it smells like. The dealer assured me that it is not what was happening. The aircon was fully gassed when inspected, so there had been no leak of aircon gas or other aircon connected explanation. The event was very alarming and in many ways I am more concerned because I do not know what happened than if I understood the explanation. It later transpired that the smell was from the ancillaries drivebelt slipping on the air-conditioning compressor pulley because the electromagnetic clutch had stuck. I'm not convinced by this "always left-foot-brake in automatics" notion. It may be fine and dandy if you never again have to drive a manual car, but if you do, your feet will be confused, your reactions slowed and the risk of an accident increased. And a lot of us drive both manuals and automatics. When I drive an automatic, I brake with my right foot and follow a very simple rule: my right foot is always on the brake unless I'm actively pressing the accelerator. I reckon that's the safest way because my foot can rest gently on the brake pedal as I coast in any situation with a potential for risk. .